Confronting a much more competitive global economy, the United States needs to coordinate an effective basic to the commercial R&D conversion process. The U.S. government has recently used a variety of R&D funding approaches including federal laboratories, federal university research grants, and commercial grants, with mixed results. While the U.S. struggles with its national model, the demonstrated success and failure of two other major models, namely the German Fraunhofer-Gesellschaft Institute Research Model and the recent conversion of Big Pharmaceutical Research to the University Proximity Model, provide excellent examples worth considering. Although President Obama set a goal of spending 3% of the total GDP on R&D funding, the proposed 2013 federal R&D funding will not reach this goal. Despite falling short of this goal, if accepted, the 2013 R&D proposal would mark a 1.4% increase from the expected R&D funding in 2012. Considering the current political and economic climate, this number seems impressive. While across the board budget cuts look to be an inevitable occurrence with talks of government sequestration, R&D investments remain a top national priority. Historically, defense R&D spending has dominated the Federal R&D budget. 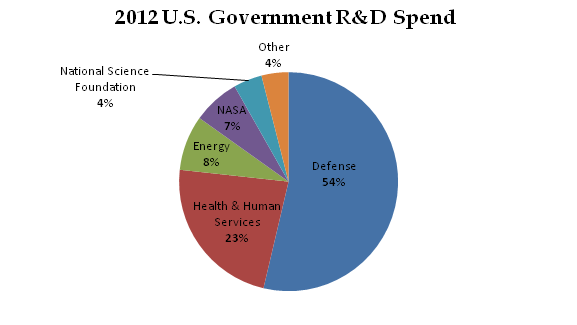 Of the proposed $140 billion in 2012, over $71 billion is budgeted to defense related R&D. Chart 1 below illustrates the amount of federal funding apportioned to different government sectors. In 2011, roughly $40 billion of funding apportioned by the U.S. government went to universities. This funding accounts for over 60% of university R&D budgets. Of this $40 billion, roughly $8 billion (20%) went to ten universities. Johns Hopkins University was the leader, receiving almost $1.9 billion in federal funding, over $600 Million of that funding was provided by the Department of Defense. The remaining apportioned dollars for federal R&D funding are distributed to 41 different R&D centers. These Federally Funded R&D Centers (FFRDC) receive a majority of the government funding and are split amongst the departments shown above. There are over 40 FFRDCs across the country. Though the government does fund a small degree of industrial innovation, choosing which companies to fund and how much money to apportion per industry, company, etc. is a very tricky process. While government funding of R&D is increasing at a slow pace, industry funding of R&D is growing at a faster rate. Increasing by $10 billion for the past two years, U.S. industries funded an estimated $280 billion in 2012 on R&D. A total of $311 billion was spent performing research and development in the industry sectors, with the excess of roughly $31 billion in funding coming from universities, government grants, and other sources. Germany finds itself atop the EU list of R&D spenders year after year. With a gloomy economic forecast on the horizon for many nations in the EU, the German economy seems to be immune to the financial bug sweeping across Europe. Many can argue that Germany's secret vaccine is R&D. The 2011 Innovation Union Competitiveness Report listed R&D amongst the "most important areas for the development of the German Economy. Industry in particular has significantly increased its R&D expenditures in recent years". At the center of this R&D growth is the Fraunhofer-Gesellschaft Institute. The Fraunhofer-Gesellschaft Institute has over 60 institutions and research establishments around the world which are organized into seven cooperative groups: Information and Communication Technology, Light & Surfaces, Life Sciences, Microelectronics, Production, Defense & Security, and Materials & Components. "Each of these groups help define the Fraunhofer-Gesellschaft's business policy and act to implement the organizational and funding principles of the Fraunhofer model". Joseph von Fraunhofer was a pioneer in optical science and application. His attention to detail, research, and experimentation allowed him to develop impressive optical glass and, eventually, the first spectroscope. His rigorous devotion to science and the development of new methodologies for studying light epitomize the work of the Fraunhofer-Gesellschaft Institute. Founded in 1949, the Fraunhofer-Gesellschaft Institute has used the same principles as Joseph von Fraunhofer to become the largest application oriented research organization in Europe. "More than 70 percent of the Fraunhofer-Gesellschaft's contract research revenue is derived from contracts with industry and from publicly financed research projects. Almost 30 percent is contributed by the German Federal and Lander Governments in the form of base funding." With a blend of private industry funding and government funding, Fraunhofer research centers can expand their scope of research and apply it directly to the development of innovative technologies that immediately benefit industry. Although still amongst the highest R&D spenders, large pharmaceutical companies are budgeting for major reductions in R&D spending (for some close to $1 Billion per year). These R&D reductions, which are attributed to expensive mergers, generic drug competition, and low ROI, are dampening the growth rate of overall industry R&D in the United States. According to John L. LaMattina, former president of Pfizer Global Research and Development, "In major mergers today, not only are R&D cuts made, but entire research sites are eliminated". A main reason for the cutbacks in pharmaceutical R&D investments, both private and governmental, are the high risk, high reward situations regarding drug development. Even when the pharmaceutical field saw huge spikes in R&D investment, it did not always correlate with an increase in critical drug approvals by the FDA. These issues have led major pharmaceutical companies to seek more effective alternatives where they can. This has caused a migration of big pharmaceutical companies towards areas with available skilled labor and areas in proximity to leading universities and research institutions. Why Are Big Pharmas Flocking to Cambridge, MA? Cambridge, Massachusetts was named after one of the most famous universities in the world. With Harvard University and the Massachusetts Institute of Technology (MIT), two of the world's most prestigious universities, as the top two employers in Cambridge, higher education has become the backbone of Cambridge's economy and community. Because of the presence of these prominent universities, as well as many global leaders in the life science field, Cambridge, MA is a Mecca for scholars and skilled workers, especially in scientific fields. Pfizer chose Cambridge, MA for a majority of their current and continued R&D efforts for precisely this reason. Pfizer is not the only pharmaceutical powerhouse to relocate to Cambridge for similar reasons. Cambridge subsection Kendall Square is especially popular in the budding Cambridge life science sector. Among the dozens of pharmaceutical and biotech companies in Cambridge is pharmaceutical powerhouse Vertex Pharmaceuticals and pharmaceutical analyst giant EvaluatePharma . Other big pharma companies in Cambridge include: Sanofi-Aventis, Acceleron Pharma Inc, Merrimack Pharmaceuticals Inc, AVEO Pharmaceuticals, ETEX Corporation, Seaside Therapeutics, Genocea Biosciences, Cerulean Pharma Inc, Visterra, Inc, Novartis Vaccines & Diagnostics, and GnuBIO, among others. "One of the main rationales for doing the Genzyme deal was to have a strong presence in research in the U.S., and clearly the first choice is Cambridge...Being the No. 1 life sciences employer in Boston is great, but we didn't want to just do the same thing we did everywhere else, having everybody inside our walls. So we created this concept of a hub. There's a core, with a lot of competencies that a big organization can bring, but the idea of a hub is that we can manage the relationships we have with everybody from Dana-Farber Cancer Institute to Harvard to MIT to the Joslin Diabetes Center to some of the biotechs we work with. And we put our own oncology research team in Cambridge. There's a whole ecosystem in Boston, and we feel integrated and at the center of it." Although the transition to Cambridge for these companies is recent for some, big pharma has been transitioning to Cambridge for a decade. In 2003 Novartis began to, "...set up a big R&D centre in Cambridge, Massachusetts, in part to better position itself to collaborate with outside academics." Despite the relatively flat level of R&D spending by the U.S. government and pharmaceutical industry, R&D spending as a whole is increasing both in the U.S. and globally. This increase is sparked by company's needs for better products, technologies, and processes to stay competitive and the realization that R&D is the birthplace of such innovation. Mariana Mazzucato, a professor at the University of Sussex Science and Technology Policy Research unit, expresses the importance of federal research funding in an op-ed piece in the Financial Times titled, "Why Private Innovation Needs Government Help". She uses the success of past and current technologies backed by the U.S. government, such as microchips, the internet, and smart phones, to stress the importance of government backing in the research and development of technologies that will grow in future decades. Because there is a major difference between the types of research and how they are funded, the government must actively work to integrate basic and applied research to streamline the implementation of innovative technologies into the commercial sector. In order for the United States economy to grow, industry must capitalize on technological advancements. To do this there must be successful cooperation between federally funded basic research and privately funded applied research. Failures within previous R&D models must serve as a foundation for developing new, cooperative R&D efforts that mimic the Fraunhofer-Gesellschaft Institute in Germany. Universities, industry, labor unions, and federal laboratories must work in unison for R&D infrastructure to promote commercial application of R&D. The financial relief provided by federal R&D tax credits is capable of serving as a bridge between these institutions. This tax incentive can help bind basic research with applied research and streamline technological advancements into the commercial sector.